Nixon Peabody lawyers take a snap before the Justice Bus takes them to a legal clinic. They've ridden a bus for the hour-long journey from downtown to Citrus College, a community college in the San Gabriel Valley. Seyler, an immigration and naturalization expert with the nonprofit Central American Resource Center, is briefing the lawyers on the work they'll be doing. These people normally command fees of several hundred dollars an hour, fees their clients can afford to pay. 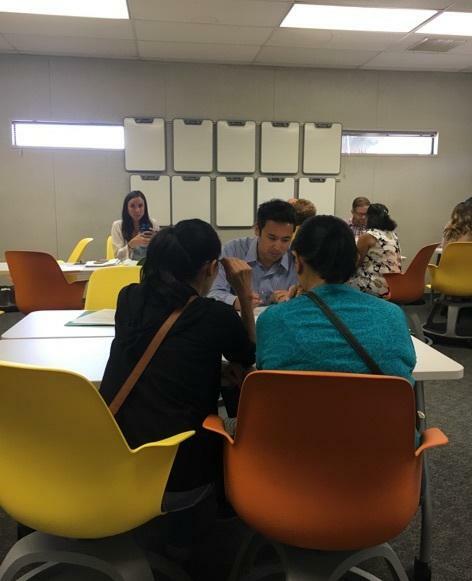 But today, gratis, they'll spend the day advising some very different clients: lawful permanent residents — often referred to as Green Card holders — who are seeking to become U.S. Citizens. Their transport — and the immigration clinic — are nicknamed the Justice Bus, run by a legal-services nonprofit called OneJustice. In the classroom where the lawyers have gathered, Seyler holds up a thick sheaf of papers. These are questions the government says must be answered if the people coming to the clinic have any hope of becoming citizens. Seyler cautions them: "On the bottom of page 14, where they have to document any contact they've had with the police or immigration — and that includes traffic tickets — see me if that comes up." The reason? How the questions are answered is as important as the way they are answered. Many lawful permanent residents have been here legally for years, even decades, without becoming citizens. There are many reasons for that. Sometimes it's the reluctance to relinquish the last ties to their homeland. Sometimes people defer becoming citizens, "because they're fearful of the system," says Seth Levy, a managing partner for Nixon Peabody's LA office, who sits on the board of OneJustice. And also, he adds, because seeking legal status for one family member may have unknown impact on others. "It's often the case that within the same family, someone's a citizen, someone's a permanent resident, someone's undocumented," he explains. And applying to the government for anything might bring unwanted scrutiny to people who came here after trying to avoid violent or corrupt government representatives in their countries. Watching Seyler and the lawyers go through the pile before sitting down with their clients, one thing becomes obvious: Applying for citizenship is a daunting, time-intensive process. And not just for the clients. "I've been practicing law for 20 years," says Justin Thompson, a Nixon Peabody partner, "and yet here I am asking questions about the forms." With both the refresher course and lunch finished, the lawyers enter a large classroom that will serve as a consultation room. There are tables and chairs for each lawyer to sit opposite his or her clients-for-the-day. The tables are far enough apart to ensure a modicum of privacy, and the noise of several people talking in low murmurs makes for a kind of white noise. The people who've come here for help range from a teenage girl who's come to translate for her mother, to Antonio, who is in his 80s. Antonio has allowed me to sit with his family and eavesdrop on their session, as long as we only use their first names (because of the uncertainty, he says, about current federal immigration policy). Antonio is a retired nurseryman, short and deeply tanned, with a wide smile and gracious manner. He looks many years younger than his actual age. So does his wife, Aurora. They've come with their grown daughter, Miriam, who will translate for them. Like some of the people in the room with them, Antonio and Aurora have had green cards for a long time, but never moved to become citizens. "Everything was good," Antonio said, through Miriam, "so I didn't think I needed to." Then he accompanied Miriam last year on what she called "my dream trip to Europe." And while they were in Italy, candidate Donald Trump became President-elect Donald Trump. "And when we came back," Miriam remembers, "we had a new president and he (Antonio) was worried they wouldn't let him in." Even though the couple had long had green cards, which allowed them to remain in the U.S. permanently, Trump's anti-immigrant speeches and promises to reduce the immigrant population made Antonio anxious. When he and Miriam returned to the U.S., Antonio and his wife told their six children (all of whom had become citizens years ago) they would apply for citizenship. "We're gonna do whatever we have to do to become citizens," he says (again, through Miriam). "Because the laws are changing. We don't know what's gonna happen to us, and we can't go back. There's nothing back there for us. All our families are here." Miriam's eyes fill as she finishes. Michele Seyler says she understands why people like Antonio and Aurora have waited to apply: "I think it's an incredibly overwhelming process for people. A lot of them are visibly anxious, a lot of them are older, and the process is really confusing, even for me. And so I can feel their stress when they walk into my office." Antonio, Aurora and Miriam settle into chairs opposite Jessica Walker, a Nixon Peabody associate. Walker tells them a bit about the process, and, as Miriam translates, tells the couple she'll take them through "a list of questions that are potentially a red flag." And there are tons of questions. Things like, has Antonio or Aurora ever helped anyone enter the country illegally, even a relative? Have they ever had a brush with the law, even a traffic ticket? Do they owe any state or federal taxes? Do they have multiple spouses? (That makes them both chuckle; they've been married for 56 years.) Have they ever associated with terrorists or terrorist organizations? The answer to all the red-flag questions is "no." The Trump administration has proposed reducing the numbers of people who immigrate legally to the U.S. by as much as 50 percent. The president has proposed a competitive application process that, he said recently, "will favor applicants who can speak English, financially support themselves and their families and demonstrate skills that will contribute to our economy." That would eliminate people like Antonio and Aurora: They don't have tech jobs. They don't speak English. They have no money to invest in an American business. Jessica Therkelsen, who oversees the pro bono program for OneJustice, believes that should not be the criteria for who gets to come or stay here. "The idea of people who've been living here for decades, who've been contributing through their taxes, whose children have grown up and gone to school here, who've served in the military, the idea of those people becoming citizens, that's a wonderful idea to me," she says with some heat. "And it's a wonderful idea to the people who volunteered here today." Finally, Antonio and Aurora are done. A little over three hours have passed. "I knew it was going to take a while," Miriam says, "but I didn't think it was going to take this long. When we set up the appointment, the lady who set it up for us said, 'bring snacks.' " She now sees the lady wasn't kidding. Antonio believes this was time well spent. "It's all right, " he assures us, smiling. "Está bien." Then the family gathers its documents, thanks and embraces Jessica Walker. They've taken their first steps towards becoming official Americans. If all goes well, they'll hear from the INS in about six months, and then begin to finish the process. As they walk out toward their car, the family passes people coming in, eager for their chance to do the same thing.